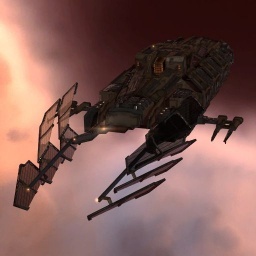 The Talwar uses rockets or light missiles to fight smaller craft like Frigates or other Destroyers. Due to its unique bonus amongst Destroyers reducing the signature radius bloom of MicroWarp Drives it is the fastest Destroyer available and able to reach such speeds without increasing its own signature radius significantly. Due to its short range and the ship heavily relying on speed, acquiring a good level of knowledge in Navigation skills can improve the ship's performance significantly. Missiles skills can increase the ship's damage output and range even more. As with all destroyers, the Talwar carries a great deal of firepower and very little tank. Unusually, it has a bonus to microwarpdrive signature bloom which, combined with its role bonus to missile range, makes it an excellent kiter, using range and speed to make up for a lack of tank. Fits vary in their emphasis on range as a defense, with some committing fully to range (and sometimes e-war) for defense and others mounting a small tank. Getting the most out of the ship's long-range capability requires fighting outside of point range; it is common for Talwars to forgo fitting tackle and instead rely on other ships to hold their targets. Fitting a full rack of light missile launchers can be difficult; Use Compact Light Missile Launcher's if you have difficulties. This page was last modified on 13 May 2018, at 16:32. This page has been accessed 185,864 times.